That time I got poison oak, ivy, sumac or something of that nature. It was 4ish weeks ago. I have been outdoors plenty in my 38 years and never once have I gotten a rash from a poisoned weed. I went out to this well traveled trail that I don't frequent often. Running down the trail I see a path and think maybe this is a trail too. Even though it's a lot less manicured than the trail you I'm on I go down it and keep going thinking "this is kinda narrow but still trail like." I keep going further and a little further down the path thinking "this is definitely not a current trail." It is really overgrown but at this point I am so far down the path that it's just "f**k it, I'll keep going." Eventually making my way out to the actual trail. A few days pass and "oh looks like I got a couple of oak mite bits." 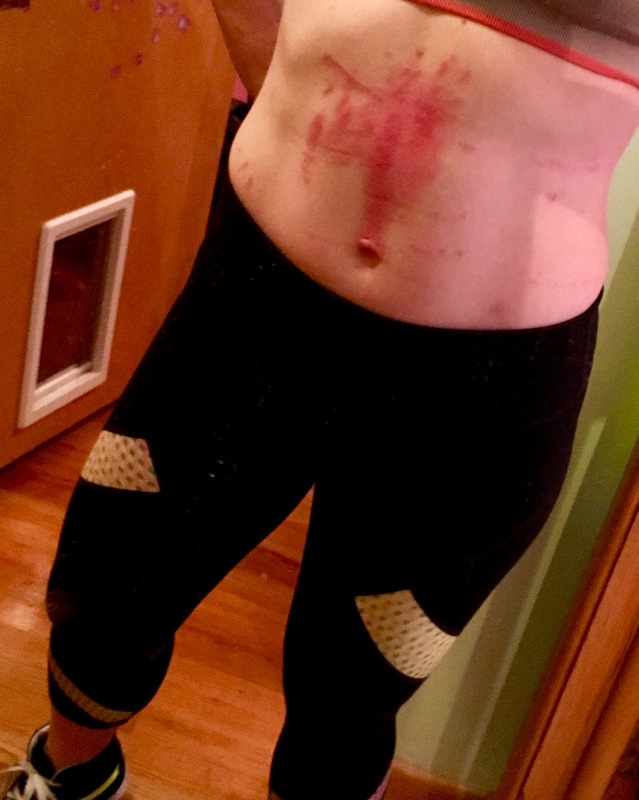 Another couple of days pass and there is suddenly this huge rash all over my abs with a few rash lines on your leg because of course I just ran in a sports bra and tiny shorts. Took this picture a few days after it started looking better, was much worse. At this point I'm thinking it is some sort of rash from the woods but of course my mind goes else where like "I wonder what flesh eating bacteria looks like?" I'm on a trip with my soon to be exboyfriend who seemed to not care and acted grossed out by it (either because he was about to dump me or he is a complete wuss who cares about no one but himself, probably all of that.) It was super fun but I just sucked it up and did nothing till I got back home. First I tried some random anti itch cream for a day, seemed to help minimally. Started texting friends and then went to FB running group for help. It was the worst 6 days in, making me so miserable. Like I skipped workouts since sweat made it itch more. I got a lot of recommendations on what to do and ended up buying the two CVS brand versions of more expensive name brand stuff. 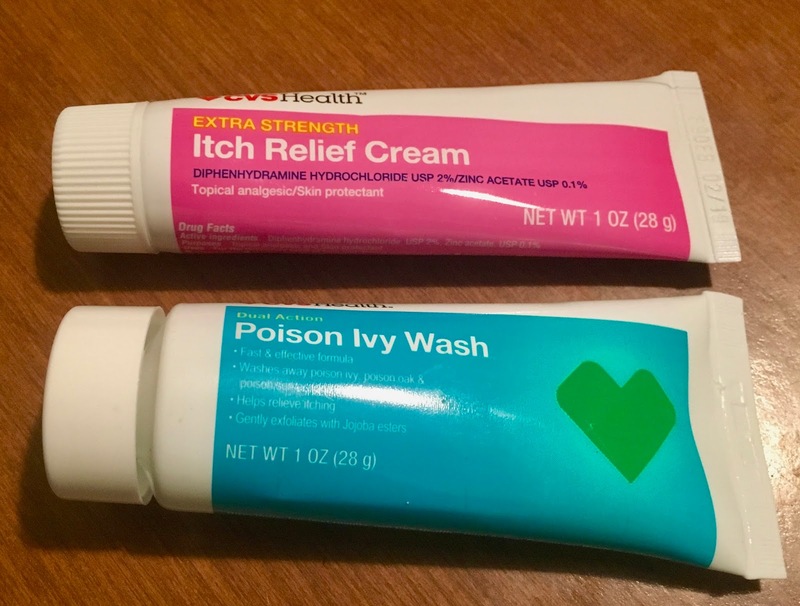 The tiny tube of poison ivy wash was $33.00 but worth it! It helped immediately. Then the itch relief cream was much less expensive but definitely made everything better. Two days later the itch was gone and 4 weeks out the scars are almost invisible. It took 5 days from actually getting it to realize I had it and I still have no idea which version of poison I had. I plan on paying a lot more attention in the future.